The last time we spoke to a Hindustan Motors (HM) executive about upcoming products from the Mitsubishi stable, he told us, “With the refreshed Mitsubishi Outlander out of the way, we’ll now concentrate on the Pajero Sport”. That conversation happened some time in 2010. And the gentleman who gave us this valuable information has left HM. And finally the Pajero Sport has arrived. So, yes, the Pajero Sport. the all-new Avatar of Pajero Sport is, well, all-new and has nothing in common with the current Pajero. Except the name. Previously Pajero had been known for it’s performance only in India and customer wants more about its looks. So the Mitsubishi did it . Like the Toyota Fortuner that is based on the Hilux pick-up platform, the Pajero Sport shares its underpinnings with the L200 pick-up truck. This platform has just gone through a thorough revision, and is a light-year or so ahead of the original Pajero in every way. We get a 2.5-litre common-rail diesel unit, which makes 178bhp and 400Nm of torque. This should be enough to push the two-tonne SUV ahead of the Fortuner which has ten less horses and 57Nm less torque than the Pajero Sport. Besides, with a smaller capacity engine, the Pajero Sport has better fuel-efficiency than the Fortuner. You also get Mitsubishi’s rally-proven shift-on-the-fly Super Select 4WD and generous ground clearance of 215mm. The front gets that typical Mitsubishi rally sport treatment. So if you’re looking for that rugged people-mover front, look elsewhere. The side is pretty boxy. And the taillights are inspired. Which may not sound good, but if your taillight inspiration is from an Alfa Romeo, well, no harm done at all. The black-and-beige inside is one of the best interiors we’ve seen in this segment yet. And after the Outlander, we do think Mitsubishi does classy, sporty interiors. It gets a double-din touch screen stereo, leather seats, climate control, air-conditioning vents for all rows among other things. Other goodies include abundant cargo space and flexible seats that fit in nearly everything an open pickup truck would take. The Sport for now will be a CBU for now but assembly in India will follow by September 2012. 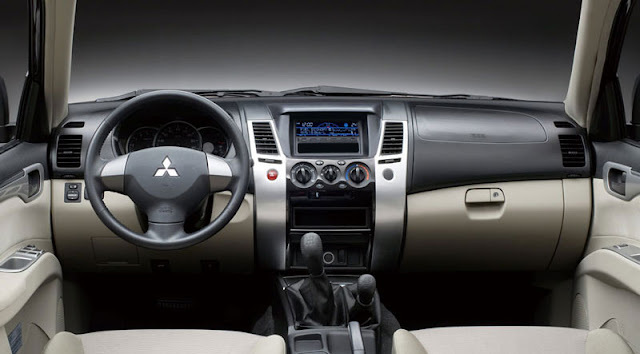 The Mitsubishi Pajero Sport will come only with a 4x4 variant and manual transmission. It is competitively priced at Rs 23.5 lakh ex-showroom Delhi. 2.5-liter 16-valve Intercooled Turbocharged DOHC Common Rail DI-D (4D56)Precision fuel delivery. High power, high efficiency and low emission performance all depend on it. The common rail direct injection feeds a high-pressure fuel supply directly to the cylinders in precisely measured sips, so each receives exactly the same amount. Using electronically controlled injection to optimize fuel dispersion within the combustion chambers, the system makes continual adjustments to always run at peak efficiency. The result is controlled power output, with exhaust emissions kept down to a minimum. Super Select 4WD Mitsubishi’s rally-proven Super Select 4WD lets you move from smooth 2H mode highway performance to rugged 4H mode traction without breaking stride. With shift-on-the-fly convenience at up to 100km/h, the right driving mode is always at your fingertips. (2WD high range) For when you’re cruising down the highway or just going across town, 2H mode shifts you into rear wheel drive for smooth, quiet, fuel-efficient performance. (4WD high range) When the weather turns bad and the roads get slick, switch to 4H mode for added traction. The dynamic 50:50 front/rear torque split gives you greater control for high-speed driving. locked center differential) Keeping you on track even in rugged or slippery conditions, the 4HLc mode distributes power equally to all four wheels for off-road excitement with a steady sense of control. (4WD low range with locked center differential) Switch to 4LLc when you need all the tractor-like crawling power you can get. Maximized low-end torque pulls you through even the roughest terrain, stickiest mud and deepest snow. Powerful brakes with vacuum booster For quicker stopping in all conditions, Pajero Sport features large front ventilated disc and rear drum brakes. With an added vacuum booster to multiply emergency stopping power, drivers can now feel confident and safe even when conditions turn hazardous. Tight minimum turning radius Pajero Sport’s remarkably tight 5.6m minimum turning radius gives drivers the ability to maneuver through tight spaces with ease. Superior terrain handling ability Some measure performance in seconds, some in millimeters. Mitsubishi measures it in obstacles overcome and goals reached. Because challenges come in all shapes and sizes, Pajero Sport is designed to climb up, over, around and through the toughest terrain that nature can provide. 4WD Traction A double-wishbone front suspension with coil springs combined with a 3-link coil spring rear suspension, both with stabilizer bars, give unmatched traction and stability with a high ground clearance for going off-road. 1. Tougher, lighter frame beams Pajero Sport uses beams made from thinner, lighter steel that provides all the strength of thicker beams, with less weight. collapsible beadsBuilt within the frame, they help absorb collision energy before it can reach the cabin interior, providing added protection to occupants.